P.O,Vizianagaram has issued Rc.No.232/A2/RVM[SSA]2014. 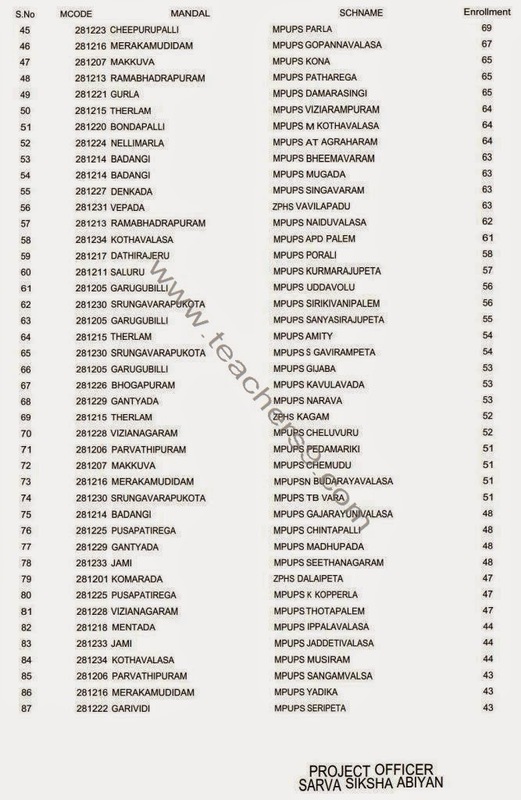 Dated: 7.02.2015 for Engaging Part time Instructors in Art Education, Health & Physical Education and Work Education in the Upper Primary Schools / Upper Primary Sections of High Schools for the academic year 2014-15. In this connections, the Headmasters of concerned School Complexes are requested to complete the selection process at School Complex level as per the guidelines given below and submit the selection lists and general merit lists to the District Project Office for engaging the Part Time Instructors for the year 2014-15. Date of Submission of General Merit List, Selection list: - -2015 Together With Xerox copies of certificates of selected Candidates to the District Project Office, Sarva Shiksha Abhiyan, Vizianagaram. Age: No person shall be eligible for any post unless he/ she is above 18 years and below 39 years of age as on 01.07.2014. However, in case of SC/ST/BC candidates the maximum age limit shall be 44 years and in case of physically challenged candidates the maximum age limit shall be 49 years. 10th class or its equivalent examination. Diploma or a certificate in drawing commercial art, fine arts and architecture, painting,sculpture, music, dance or a certificate in higher grade drawing certificate from a recognized institution Posses technical teacher certificate of Government of Andhra Pradesh. Under Graduate Diploma in Physical Education / B. P. Ed from a recognized institution.